You’re a Christian. You’re at a movie theater. Your atheist friend has invited you to see a movie called “God Is Dead.” All your friends told you it was a horrible movie and you shouldn’t see it, but your friend who invited you seems nice, and she was persistent… so against your better judgment, you agree to go. It sounds ridiculous, but stay with me. Instead of making a reasoned and intelligent defense for the Christian faith, the professor treats the student like an idiot. The rest of the class nods in agreement. Then the professor offers the student one chance to get a passing grade: debate him about the existence of God. So far, so good, you think. The debate is fierce. The professor is firm in his logic, but the student asks why he’s angry about the non-existence of God. The student puts forth arguments against the existence of God that the dumbest Christian you know could rebut in her sleep, and the supposedly brilliant Christian philosophy professor is stunned and stumped. The entire classroom gives up their Christian faith over those ridiculous arguments that you could destroy if the professor would just ask you. Finally, the student and all his friends go to a rock concert celebrating the death of God. The professor finally realizes his error and runs to the concert, but is hit by a car. There in the street, he is met be evangelical atheists, and he renounces his faith in God at the last. One of the atheists you respect least appears on stage at the rock concert and tells the concertgoers they should all text “God Is Dead” to all of their friends. Your atheist friend sitting next to you has her phone out. Your pocket vibrates. You have a text. As you leave the theater, your friend is anxious to know how you liked the movie. You don’t want to offend her, but you almost threw up your popcorn ten times during the movie, and you were on the edge of your seat the whole time – not because it was interesting, but because you were on the verge of walking out and demanding a refund for this abomination of a movie. Now you know how atheists felt when they watched God’s Not Dead. Atheists are as sure that God isn’t there as you are that God is there. Would that movie make you think that atheists were smart, or incredibly stupid? 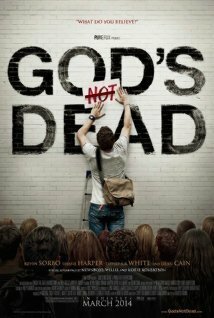 Would you think atheists had created a compelling argument, in movie form, for atheism? Would you convert to atheism? I didn’t think so. If I were a betting man, I’d bet you’d go out and tell your friends what a horrible ridiculous movie you’d just endured, and maybe find a way to mock it. So why would Christians think, if the roles were reversed, atheists would give up deeply-held beliefs over text messages and a series of bad arguments? True or not (though I do believe in God), God’s not dead is one of the worst arguments for God. Come on, Christians. We can do better. We can show the beauty of Christianity instead of making bad arguments for its truth. Also, that little fantasy circulating about the professor who says God doesn’t exist and is schooled by a freshman? It’s almost as bad, and for the same reasons. At least your atheist friends didn’t have to pay any money for it, and at least it wasn’t 2 hours long. One of the topics I remember most from ethics class was a study of emotivism. Too often it seems that arguments for/against God devolve into fist-banging and shouting competitions.